LUXURY STONE VILLA ,HUGE GARDEN, FANTASTIC VIEWS, POOL, VOLLEY/FOOTBALL ,SLIDE, WIFI,..This stunning luxury stone villa is in just the ideal location, sitting in it’s very own private secluded gardens hidden amongst the orange groves.It is the perfect place to sit back and relax in peace and quiet away from the hustle and bustle of every day life, yet in just a couple of minutes in a car you can be in the traditional Spanish village of Pedreguer and a little further on you can experience all the sites and flavours of Denia, Javea and Moraira.The villa itself has been lovingly renovated to a very high standard with exposed wooden beams and traditional stone walls, with a stunning interior gallery with water fountain and intrecate window features, that give it a unique warm, peaceful, ambience.As you approach the house down a private road you arrive at the electric gates and private entrance to La Finca Bella. On entering you can barely see the beautiful finca hiding behind the small forest of almond and walnut trees, there is a large gravelled car park and roundabout with ample space for 5 + cars. This leads onto a narrow winding pathway to the house entrance with an open porch and beautiful natural stone well. Through a quaint handmade wooden door you enter the large open country kitchen that oozes with character that sets the theme for the rest of the house, with patio doors leading to the fantastic outside pool. Back in the kitchen there is a reclaimed stone butler sink, extensive tiled work surfaces and ample cupboard space, full size fridge and separate full size freezer. To add to the social family area is a centre island with stools for family and friends to sit around and chat while you cook up a delight on the double hob and oven.The open kitchen leads onto the dining area which is in the heart of the house with a large dining table which seats 8 comfortably. Behind the large table is the real log burning fire and above is the open gallery with open railings and water fountain feature and an interior mediteranean style window. In the dining room is also the music system which controls the multi room audio system for inside and outside the house as well as a docking station for your ipod to enjoy your very own special holiday sounds.The cosy lounge is separated from the dining area and kitchen by the two huge original wooden doors. In this room you can relax on two ample sized cream leather sofas to catch up with Sky TV and DVDs for the kids. There are also two patio doors from here leading to the large outside patio and pool area.From the lounge you enter the downstairs kingsize bedroom that exudes character and comfort, with a window that looks out onto the patio and pool area.From the dining area there is the original staircase made from antique tiles leading to the upper interior gallery.The first bedroom you come to is the large master bedroom again full of character, with drapes over the bed, separate sofa and a romantic balcony of grapevines and flowers overlooking the very inviting pool. Opposite the master bedroom is the main bathroom that is unique to say the least, there is a huge luxury Turkish style bath and shower which gives you the massive wow factor. Again in here is multi room audio so you can relax to your music whilst soaking in this luxury bath.Next to the main bathroom are the 2 twin bedrooms which are mirror images of each other, both full of character with exposed stone walls and rustic floor tiles. Each bedroom has its own private door to step out onto the large roof terrace which is completely surrounded by grapevines to give total privacy and seclusion. From here you have breathtaking views stretching across the orange groves in the valley to the stunning surrounding mountains all the way down to the Mediterranean sea.The terrace also has multi room audio system.The sunset from this spot is incredible, a must with a glass of wine. The huge flat plot has an abundance of various fruit trees and grapevines perfect for the kids to have an adventure climbing trees and playing on rope swings while you relax in the hammock set between the trees.There are also several seating areas round this shaded side of the house where you can shelter from the midday sun under the trees and grapevines.On the poolside of the garden is an open lawned area with swing and slide, a kids toy log cabin and a mini goal and football playing area to keep the kids entertained.The pool is fenced off from this area to give you peace of mind whilst the children play safely in the garden.On the south facing pool side of the house you can enjoy the Spanish sun for over 320 days of the year, it is a real sun trap for both winter and summer lets, with a huge terrace with 8 sun loungers, a gorgeous comfortable 3 piece sofa and table under a large parasol for those warmer months. At the far end of the patio next to the orange groves is a shaded wooden pergola covered in grapevines, under which sits a huge Henry VIII style handmade wooden table with tree trunks for legs and benches for seats.This is a fantastic place for all the family and friends to gather round to enjoy some Al Fresco Mediterranean dining prepared on the barbeque which is directly next to the table so the chef can be involved with the fellow diners. Everyone comments on the fantastic crystal clear 10.5x 5.5m pool.Straight from the kitchen you walk out to the Roman style steps into the pool which has 4 sunken bar stools to cool off whilst you enjoy a refreshing drink under the shade of the traditionally thatched parasol.The pool itself has been specifically designed for children and games in mind, unlike many standard pools that are too deep for the kids even in the shallow end, this pool is only 1metre deep to half way and then decends to 2m at the deep end.This makes it perfect for fun and games in the water and a great volleyball net stretching the width of the pool is supplied so you can have hours of fun in the cool water or the more relaxed can look on from their sunken bar stalls. 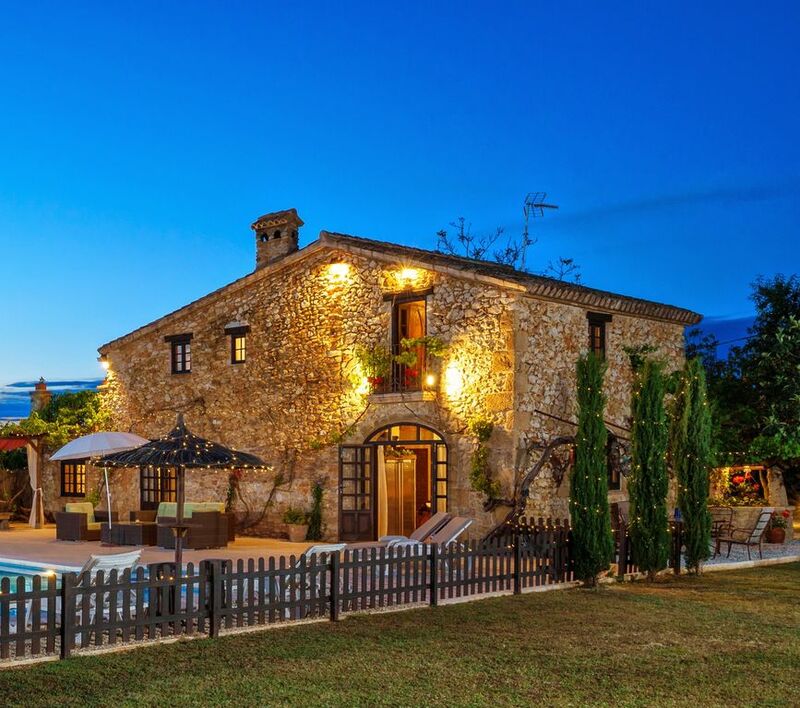 The finca is also ideal for 2 families or a family holidaying with grandparents. Lots of toys to entertain the children. Owners/property manager are local should you need them.To sum up this magical house has it all for a family holiday of a life time, you will not be disappointed. The traditional village of Pedreguer is close to the beaches of Javea and Denia yet it is away from the maddening crowds and so it makes for a perfect holiday location if you want to enjoy a taste of the real Spain.Pedreguer is a typical Spanish market town located at the foot of the Muntanya Gran and is the gateway to the beautiful Orba Valley famous for its orange groves and a short trip inland to the Jalon Valleys famous vineyards is also highly recommended. The area offers breath-taking scenery for a pleasant drive and in February this is the best place to see the almond blossom and green valleys covered in orange trees.This original village has cafe bars & restaurants where you can enjoy drinks or traditional tapas along the main street , many of the façades of the houses are painted in vivid colours, which give the village a lively appearance. Around the main square you can see some of the most beautiful 19th Century facades as well as “els Porxes”: the market square is covered with Arabic tiles and constructed with cast-iron pillars and wooden beams.Pedregeur offers visitors the chance to take a walk through the town centre and discover beautiful ancient buildings such as the parish church of Santa Cruz (16th century). Outside the town centre there is the Sant Blai chapel, from which we can see the Segaria mountain range, the Montgo Nature Park and La Sella with the famous Golf course,Tennis & the five star Marriott Hotel & Luxury Spa. A perfect setting for those cycling enthusiasts as well as Horse riding, mountain or country walks or for those who enjoy the faster pace quad biking through the beautiful Orba valley. For those of you who like to shop Pedreguer has something to offer everyone. Those who like a bargain can make their way to the car boot sale or Rastro market held every Sunday on the nearby industrial estate or the traditional vegetable market in the town square every Saturday. The village also specializes in the manufacturing of bags, hats and leather goods. Try also visiting the neighbouring village of Gata de Gorgos which is famous for it’s wicker furniture shops or Ondara with it’s historic bull ring. Within a 5 minute drive along the N332 you will find the modern shopping centre ‘La Marina’ which has a wide range of shops, a cinema and restaurants. Parking is free. Every New Year the festival season begins with Reyes Magos, Cavalcade of the Three Kings. This festival starts on the 5th of January. It is the day that the Spanish traditionally celebrate their Christmas. On the 17th of January the people of Pedreguer celebrate the Fiestas of San Antonio Abad, with pilgrimage, blessing of animals and popular celebrations. On the 3rd of February there is a religious festival - the Festival of Sant Blai, with sales of the traditional 'porrat', sport events and concerts. Pedreguers festivities would not be complete without the annual Carnival which lasts from February 20 - 27 . It includes many Fancy Dress Parades and street dancing, with the burial and 'Cremá' (burning) of the Sardine. During the month of July is the main town fiestas in honour of San Buenaventura with bull-running throughout the town, 10 days as from 11-12 July with spectacular costumes, music, live bands,parades and much much more…. Please note that the heating charge is seasonal (1 November - 31 March) and costs EUR 20 per day. Please note an obligatory cleaning fee of EUR 120 is applicable. The hot tub is optional and carries a surcharge of EUR 70.